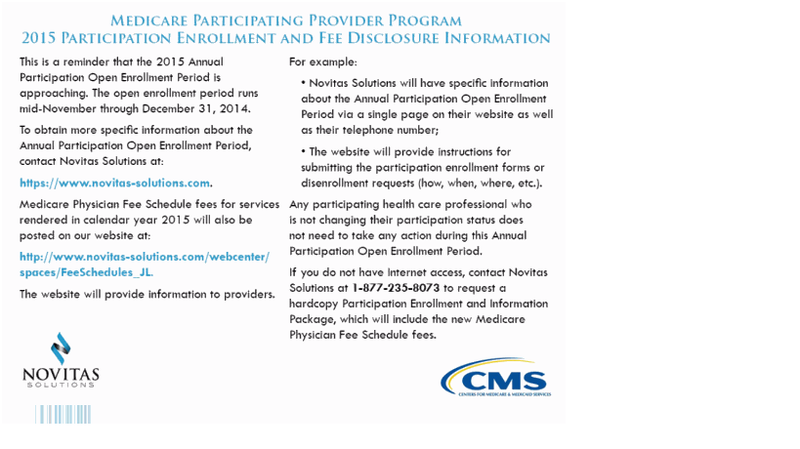 View the Centers for Medicare & Medicaid Services (CMS) Announcement about Medicare Participation for Calendar Year 2015. Medicare fee schedule amounts are 5% higher if you participate. Included in the Medicare Participating Directory (MEDPARD). Participants have "one stop" billing for beneficiaries who also have Medigap coverage and who assign their Medigap payments to the participant. When a participating provider bills us, we also automatically advise the Medigap insurer to pay the participant for the beneficiary's co-insurance and/or deductible. The annual participation enrollment program for CY2015 will commence on November 14, 2014, and will run through December 31, 2014. Participation agreements cover the period January 1, 2015 through December 31, 2015, and may not be changed after December 31, 2014. If you are currently participating, do nothing. If you are not currently a Medicare participant, complete the blank participation agreement, making sure to include all of the names and identification numbers under which you bill. If you are currently not participating, do nothing. A statement indicating that you are rescinding your participation agreement. The written notice must be postmarked prior to January 1, 2015. To view the calendar year 2015 Medicare Physician Fee Schedule and Anesthesia Conversion Factors, please visit your Novitas Solutions Part B Fee Schedule web page. We encourage you to visit the Medicare Learning Network (MLN) the place for official CMS Medicare Fee-For-Service provider educational information. There you can find one of our most popular products, MLN Matters national provider education articles. These articles help you understand new or changed Medicare policy and how those changes affect you. A full array of other educational products (including Web-based training courses, hard copy and downloadable publications, and CD-ROMs) are also available. You can also find other important physician Web sites by visiting the Physician Center Web page. In addition to educational products, the MLN also offers providers and suppliers opportunities to learn more about the Medicare program through MLN National Provider Calls. These national conference calls, held by CMS for the Medicare Fee-For-Service provider and supplier community, educate and inform participants about new policies and/or changes to the Medicare program. Offered free of charge, continuing education credits may be awarded for participation in certain National Provider Calls.